Kayla Combs stands at the head of the Anatomy Lab table surrounded by medical students examining their patient’s musculoskeletal system. “If you pull on this tendon here, it will cause the fingers to move,” Combs demonstrates. But the teacher isn’t a med school faculty member. She’s a doctoral candidate in UCF’s physical therapy program participating in an interdisciplinary session designed to better educate future doctors on human anatomy. She is one of three PT graduate students serving as teaching assistants during this year’s Anatomy Lab module. The College of Medicine’s Anatomy Lab module is unique nationally. Cadavers are considered a student’s first patient. First-year medical students don’t just memorize organs and body systems – they become forensic detectives trying to determine their patient’s cause of death. PT students provide additional expertise, Dr. Topping said, because they have spent seven months studying in a cadaver lab compared with 17 weeks for med students. The PT students — Combs, Akash Bali and Kelly LaMaster — were chosen based on their expertise and teaching experience. They come in every Friday for the four-hour lab, and teach under the supervision of Dr. Topping and other core and volunteer faculty. 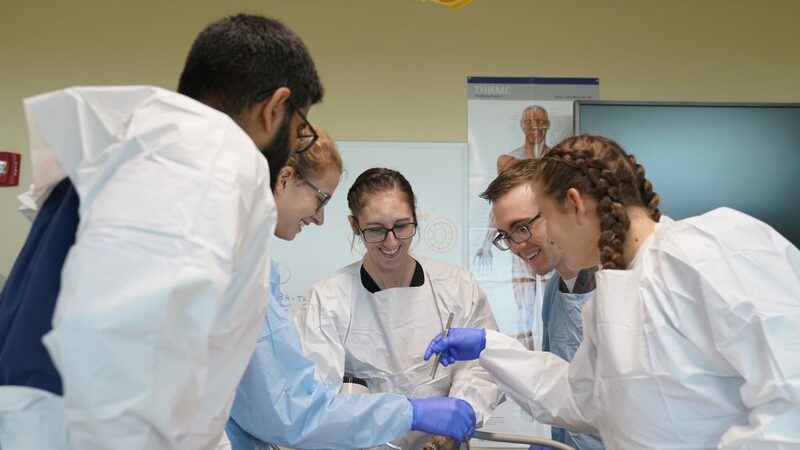 The PT students say the collaboration has been an opportunity to “get inside the mind of med students” which will give them a better understanding of the physician’s perspective as far as pathologies, clinical diagnoses and treatment. 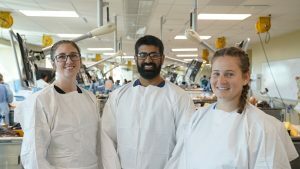 Second-year DPT students (L-R) Kelly LaMaster, Akash Bali and Kayla Combs. With the development of UCF’s new Academic Health Science Center (AHSC), which will ultimately bring many UCF health programs to Lake Nona, Dr. Topping says such collaborations are only the beginning of an exciting future for healthcare education.